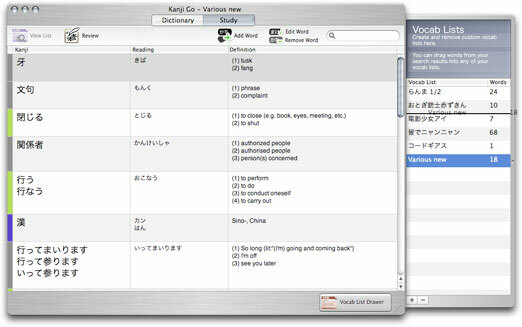 Kanji Go lets you create and edit custom vocab lists so you can easily review words from your search results. 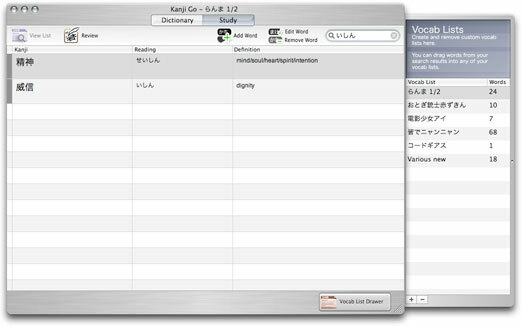 Vocab List Drawer: Open the vocab list drawer by clicking its button in the bottom right corner of Kanji Go. Add/Remove Lists: You can add and remove new lists by clicking the + and - buttons at the bottom of the drawer. 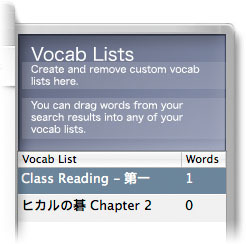 Customize List Names: Double click a vocab list's name in the drawer to customize it. Add Words by Searching: Add words by dragging any row from your search results. 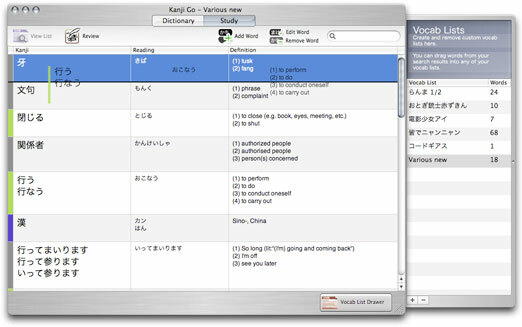 Add/Edit Words Manually: If you can't find a word in the dictionary, you can add it manually by selecting the 'Study' tab and clicking the 'Add Word' button at the top of Kanji Go. You can also Edit words you've already added to a list by clicking the 'Edit Word' button in the 'Study' tab. Rearrange Lists: You can drag and drop List Names within the Vocab Drawer to change their order. 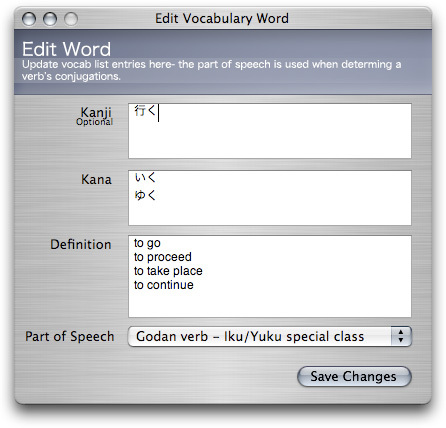 Rearrange Words within Lists: You can also drag and drop words within a list to change their order. 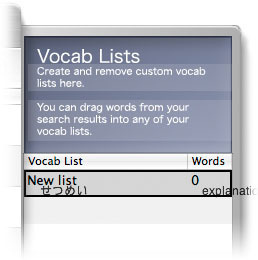 Quickly Search Lists: By typing into the search field in the top right corner of the Vocabulary list window, you can quickly search your lists for a given word. Any words that contain your search criteria will be shown, while the rest are hidden. You may change lists (by clicking a different list name in your vocab list drawer) to instantly apply the filter to the new list. 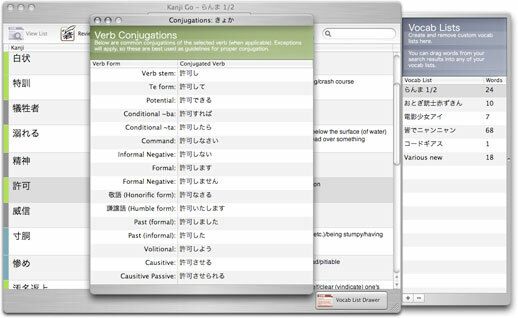 View Conjugations: Entries marked with blue and green may be double clicked to display their adjective/verb conjugations respectively. Once you've created your lists, you're ready to start studying.